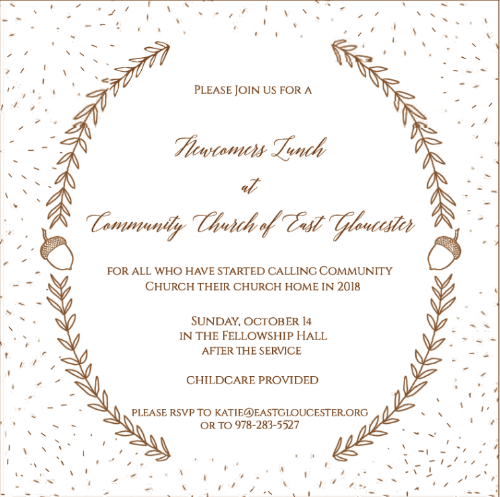 If you are new to our church in the last year or so and you consider Community Church your home, we’d love to have you join us for a Newcomer’s Lunch after the worship service on Sunday, October 14. (And if you’re not new but want to help us prepare for this lunch, let us know!). This is a great chance to meet other new attenders and find out more about next steps for getting involved in the life of the church and growing with us. Childcare will be provided for this event. Please RSVP to Katie if you plan to attend so we can be sure to prepare enough food. Looking forward to seeing you there!